Citation: C N Trueman "The Causes of the Vietnam War"
The causes of the Vietnam War were derived from the symptoms, components and consequences of the Cold War. The causes of the Vietnam War revolve around the simple belief held by America that communism was threatening to expand all over south-east Asia. Neither the Soviet Union nor the United States could risk an all-out war against each other, such was the nuclear military might of both. However, when it suited both, they had client states that could carry on the fight for them. In Vietnam, the Americans actually fought – therefore in the Cold War ‘game’, the USSR could not. However, to support the Communist cause, the Soviet Union armed its fellow Communist state, China, who would, in turn, arm and equip the North Vietnamese who fought the Americans. Before World War Two, Vietnam had been part of the French Empire. During the war, the country had been overrun by the Japanese. When the Japanese retreated, the people of Vietnam took the opportunity to establish their own government lead by Ho Chi Minh. However, after the end of the war, the Allies gave back South Vietnam to the French while the north was left in the hands of the non-communist Chinese. The Nationalist Chinese treated the North Vietnamese very badly and support for Ho Chi Minh grew. He had been removed from power at the end of the war. The Chinese pulled out of North Vietnam in 1946 and the party of Ho Chi Minh took over – the Viet Minh. In October 1946, the French announced their intention of reclaiming the north which meant that the Viet Minh would have to fight for it. The war started in November 1946, when the French bombarded the port of Haiphong and killed 6,000 people. The French tried to win over the people of the north by offering them ‘independence’. However, the people would not be allowed to do anything without French permission. A new leader of the country was appointed called Bao Dai. The Russians and Eastern Europe refused to recognise his rule. They claimed that Ho Chi Minh was the real ruler of Vietnam. The French had got themselves into a difficult military position. Despite huge American help, the French could not cope with the Viet Minh’s guerrilla tactics. The Viet Minh were by now receiving help from Communist China – Mao Zedong had taken power of China in 1949. The fact that two opposing sides had developed was classic Cold War history.The country was meant to be ruled by Bao Dai who was supported by the west. Ho Chi Minh was supported by the Russians, Chinese and Eastern Europe – all communist. In November 1953, the French sent men from their crack Parachute Regiment to Vietnam. It was naturally assumed by the French that this unit would defeat the untrained Viet Minh guerrillas. They were sent to Dien Bien Phu in the north. In May 1954, the regiment was attacked by the North Vietnamese and surrendered, which came as a terrible blow to the French people. The French pulled out of Vietnam in the same month. In April 1954, the world’s powers had met at Geneva to discuss Vietnam. In July 1954, it was decided to divide the country in two at the 17th parallel. Bao Dai was to lead the south and Ho Chi Minh the north. The meeting also decided that in 1956, there would be an election in both the north and south to decide who would rule the whole country. The election would be supervised by neutral countries. This election did not take place and the split had become permanent by 1956. North Vietnam had a population of 16 million. It was an agricultural nation. The Viet Minh trained guerrillas to go to the south to spread the word of communism. Their weapons mostly came from communist China. To the surprise of the South Vietnamese, those Viet Minh who went to the south helped them on their farms and did not abuse them. They had become used to fearing soldiers. Instead, the Viet Minh were courteous and helpful. 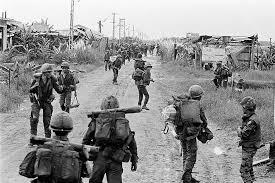 South Vietnam also had a population of 16 million. Its first proper leader was Ngo Dinh Diem who was a fanatical Catholic. As communism hated religion, Diem hated all that communism stood for. This is why he got America’s support – he had a poor record on human rights but his rule was in the era of the “Domino Theory” and anybody who was anti-communist in the Far East was likely to receive American backing – regardless of their less than savoury background. Ngo ruled as a dictator along with his brother – Nhu. Their government was corrupt and brutal but it was also backed by America. After the non-election of 1956, the Viet Minh became more active militarily. Their guerrillas – now called the Viet Cong – attacked soft targets in the south. 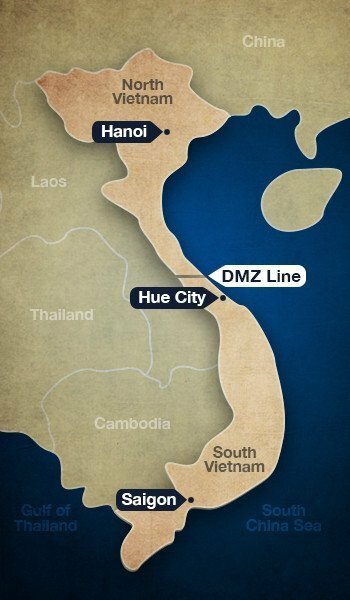 They used the Ho Chi Minh Trail which was a 1000 mile trail along the border with Laos with heavy jungle coverage so that detection from the air was very difficult. The Viet Cong were trained by their commander Giap who learned from the tactics used by the Chinese communists in their fight against the Nationalist Chinese forces. He expected his troops to fight and to help those in the south. He introduced a “hearts and minds” policy long before the Americans got militarily involved in Vietnam.